At the end of a year, most people tend to look back to see whether they can learn something from the past 12 months. I am no exception. So this is an inside look at the stats for baekdal.com in 2009. 2009 was a rather good year. Baekdal.com set a new record of 2,490,548 absolute unique visitors, which is all thanks to you. I could not, and would not, be able to do any of this without you! 62% of my traffic comes to the design section, 14% to my articles, 5% to future trends. While none of this is really surprising, what is surprising is that on Twitter - 68% of all tweets is linking my articles, and only 34% links to the design articles. This further proves the point that Twitter is primarily a place for information sharing. Something that SheSpeak also found in a recent study. The biggest change of all, is perhaps the influence of social channels. A few years ago, social channels where merely a footnote. It was very interesting, but it did not provide the majority of the traffic. In 2009, on baekdal.com, social became the absolute dominant source of traffic. And also the dominant source of exposure. In 2009, Google Search only accounted for 0.6% of my traffic. Stumbleupon provided 53%. In total, 72% of my traffic came via social channels. My content was retweeted 20,120 times, mentioned on 11,960 blogs and it provided more than a million readers via Stumbleupon and Digg. In terms of brand exposure, the social effect is quite telling. 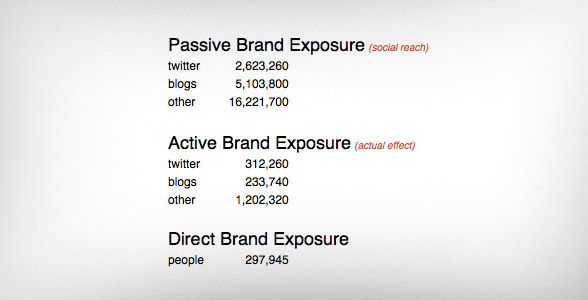 The passive brand exposure reached 24 million people in 2009 (people who have been exposed to the brand 'baekdal' in some form - also called social reach). Of those, 1.7 million people turned into readers (active brand exposure). All of it generated by word-of-mouth via people sharing my content and links. Without the social sharing effect, I would only have reached 297,945 people (direct brand exposure), so it is safe to say that social channels are extremely important to what I do here on baekdal.com. One important thing to notice. Digg and Stumbleupon are far better at getting people to visit this site, than sites like Twitter and Facebook. While Twitter did provide a lot of exposure in 2009, it wasn't that effective in generating traffic. I think the reason is that Stumbleupon and Digg are places that you expect to find links - whereas Twitter and Facebook are places where people largely want content. And this is what you should be focusing on. Instead of posting a link to your website, reformat your message to fit 140 characters. Or on Facebook, instead of posting a link to a picture on your website, post the picture on Facebook instead. This is a far more successful way of doing things. Note: I have been seeing the same pattern with several of my clients. Posting the content directly on the social channels usually multiplies the engagement level by a factor of ten (or more). 40% of my tweets are very-small-articles posted as content on Twitter and Facebook, 55% are links to other interesting people/content, and only 5% are links to baekdal.com. And I think this is a good formula for using social networks. All this social interaction also serves to illustrate that making your content portable and shareable must be your number one priority. There is a huge difference between a direct exposure of about 300,000 people and a social reach of 24 million (of which 1.7 turned into readers). And finally for the technically inclined. in 2009 Baekdal.com received 124,081,746 requests, and transferred a total of 3,885,397 MB (3,7 Terabytes).